Three teens are in custody in connection with the assault and carjacking of an Uber driver which took place Wednesday night. The incident happened at about 9:30 p.m. in the area of Charles R. Street in Eastpointe. Three teens are in custody in connection with the assault and carjacking of an Uber driver which took place Wednesday night. The incident happened at about 9:30 p.m. in the area of Charles R. Street in Eastpointe. Police say the three teens allegedly assaulted the driver and took his Cadillac. Officers were able to electronically track the vehicle to a location in Warren and, with the assistance of officers from Warren and Roseville, the teens were located in a nearby home and taken into custody. The suspects are all male, aged 14, 14 and 15. 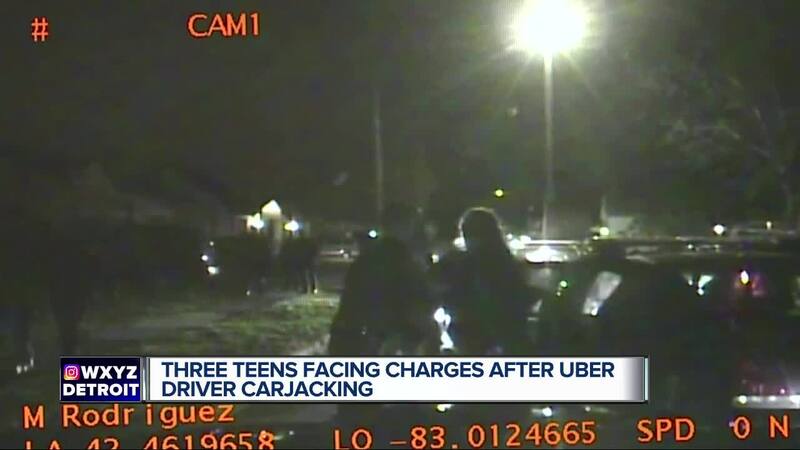 The teens are charged with carjacking and unlawful imprisonment of an Uber driver. A judge ordered them to be held without bond in the Macomb County Juvenile Center. The judge also granted the prosecutor five days to decide if the three teens will be charged as adults, which could bring a life sentence if convicted. Police say two of the teens live in Eastpointe, where the assault took place. The third teen lives in Warren, where they drove the stolen Cadillac. Warren police dash cam video shows the arrest. Authorities say two of the teens were hiding in the back seat of an SUV parked in the driveway at the home in Warren, and the third teen was arrested in the basement of the house. Police added that they tracked the stolen car with On Star and a Detroit Police helicopter. Parents walked out of Juvenile Court without commenting. Two parents earlier said they didn’t know what happened and refused to comment as they were leaving the court.